Welcome to our stop on The Eighth Wonder blog tour hosted by Virtual Author Book Tours. Our first stop is our review and tomorrow's stop includes a guest post by author Kimberly S. Young. A modern Bridges of Madison County, Nicole Benson, 35, is an ambitious college professor with dreams of teaching at an Ivy-League school until she meets Tom Ryan, 44, married 23 years and shattered after his daughter's death from leukemia. A first-generation in her family to go to college, Nicole is a self-made woman. She put herself through school, sacrificing marriage and children for her career. In the summer of 1997, she finally graduates with a Ph.D. from NYU, but her life is thrust into chaos when her father is diagnosed with terminal cancer. Abandoned by her mother as a girl, her father is all she has. After fifteen years in New York City, Nicole leaves everything and everyone she knows to teach for a year in rural Bradford, Pennsylvania to be close to him in nearby Buffalo. Now, trapped in tiny Bradford, she has never felt more alone in her life...until she meets Tom Ryan. At 44, Tom represents what Nicole longs to be: settled, secure, and clear about his purpose and direction in life. Emotionally scarred, he and his wife are empty nesters with an older son away at college and struggle to grieve together after the death of their daughter. Tom and Nicole's story begins as a journey of self-discovery for both of them but turns to bittersweet romance when their friendship becomes love. Nicole risks offering what she has never given before, her heart; and Tom has never felt happier or more conflicted when he falls in love for the second time in his life. Kimberly Young is a licensed psychologist, an author, and an internationally-known speaker on Internet addiction. In 1995, she founded the Center for Internet Addiction and since then she has written numerous articles on the topic including four books, Caught in the Net, Tangled in the Web, Breaking Free of the Web, and Internet Addiction: A Handbook for Evaluation and Treatment. She is a professor at St. Bonaventure University and her work has appeared in hundreds of media outlets including The New York Times, USA Today, Time, and Newsweek, and she has appeared on The Today Show, Good Morning America, CNBC, CNN, and ABC World News Tonight. She has written creatively on and off since she was eight-years-old, mainly working on poems and short stories. While recovering from retina re-attachment eye surgery, she was homebound for several months and decided to pursue her creative writing more seriously. The Eighth Wonder is her first novel. The Eighth Wonder declares it is a contemporary Bridges of Madison County and that's a decent comparison. Both books deal with the symbolism of a bridge and in Kimberly S. Young's novel, that bridge is the Kinzua Brigde which is located in Bradford, PA (it is also on the book cover). But where I thought Robert James Waller's novel occasionally became mired in saccharine scenes, The Eighth Wonder does not. Nicole has devoted her life to her job as a professor and finishing her education. After she receives her Ph.D. from NYU she learns her father is ill and takes a teaching job in Bradford to be near her dad in Buffalo. Even though I've never been to Bradford, Kimberly S. Young paints such a vivid picture of that place, I feel I know it. As Nicole grapples with her father's illness, she meets Tom and a friendship ensues. Their friendship deepens and turns to love which then becomes adultery since Tom is married. Adultery is a tough topic to read about and while I can't condone the couple's relationship, I certainly understand it. These characters are well written and have such depth. I didn't connect to them personally, yet I enjoyed reading their story. The author handles their forbidden affair with a striking candidness and compassion which gave the novel heart. 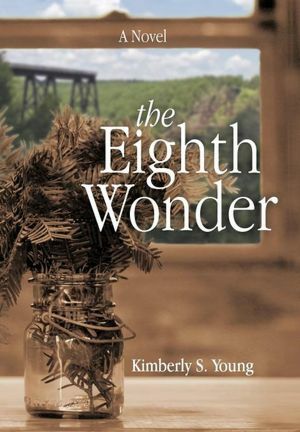 Thought provoking, touching, and honest, The Eighth Wonder is a novel bridging two lives together providing these individuals with a special love each needed at that time in their lives. Without melodrama, the author gifts the reader with an engrossing character study about the healing power of love. Everything happens for a reason is a common adage we hear and in The Eighth Wonder, a tender, gripping love story, this adage proves truthful for Nicole and Tom. Cover comment: This cover makes so much sense after reading it. The bridge in the background is symbolic and the view lovely. Book source: I received a promotional copy from the author in return for my honest review. Thanks for taking part in the tour. I'm so glad you enjoyed the book. I loved it! It also felt to me like the bridge was a character in the book. Thank you for taking time to review The Eighth Wonder, I am so pleased that you enjoyed the story and the characters!